As a business owner, you’ve got a strong vision for your company. But juggling its everyday needs can make it difficult to transform your vision into a thriving, successful business. We can help. As your growth strategy consultant, we get into the core of your business, create innovative solutions, and keep you moving forward to ensure your company stays relevant in a constantly changing market. A clear game plan. We construct a detailed sales and marketing strategy of practical and effective steps mapped out on a specific timeline. You’ll know exactly what to do and how to do it for more profitable results. Expert guidance. We have 20 years of hands-on experience starting companies from the ground up, so we see your business from every angle. With our assistance and a focused strategy, we’ll help you make decisions with confidence and objectivity. A trusted, creative partner. A true collaboration will bring out the best in you. So we strategize constantly – even when we’re not in session together – to create targeted, innovative ideas that will connect you to the heart of your audience to grow your business. Enthusiastic support. A clear game plan is nothing without action and follow-through. I motivate, inspire, and empower you to move forward and commit to every step. Lucrative results. Once you have a solid business strategy and techniques for working smarter, you’re inspired to implement them. With our clear game plan in place, your business will flourish. 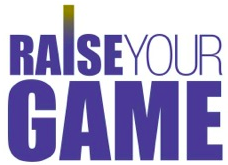 Are you ready to raise your game? We’ll arm you with the tools you need to take your business to the next level. Call or email us today for a free consultation. © 2019 Raise Your Game.